Police are investigating a remark sent from a Labour councillor's Facebook account saying "Hitler had the right idea" about travellers. 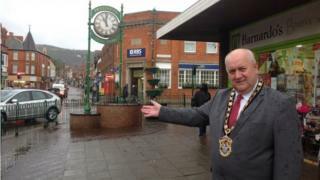 Denbighshire councillor Bob Murray has denied making the comment, which has seen him suspended from the party. He suggested his account may have been hacked. A councillor colleague said the comment was "vile". North Wales Police said it was investigating the "alleged hate crime". Labour is conducting its own investigation. The comment had been posted on a Facebook thread started by fellow Denbighshire councillor Paul Penlington about a group of travellers. It said "Hitler had the right idea", and asked if anyone had any "gas canisters". Mr Penlington said the comment was "a vile racist statement" and contacted council bosses immediately when he was alerted to the message, which he deleted. He told the Local Democracy Reporting Service: "I put a post on Facebook informing residents of Denbighshire council's sensible response to a small group of travellers in my ward. "I only stated the facts to avoid any misinterpretation as this can be a contentious subject for many people. "I am absolutely nauseated by the post and quite upset really that my good name has been drawn into this." Mr Murray "categorically" denied making the comment on Facebook. "I'm not a technophile but I speak to my friends who know that these things can be hacked," he said. "So now I just have to go ahead and talk to the police and talk to a solicitor and find out the way ahead. But I categorically would not say anything like that." Trudy Aspinwall, of the traveller, Roma and Gypsy rights group Travelling Ahead, called the post "appalling". "These appalling comments published on an on-line public platform are a hate crime," she said. She added: "It would be absolutely unacceptable to say this publicly about any other group, and it's particularly concerning if this comes from a publicly-elected representative who has a role in decision making about local plans to improve services for this community." Labour MP Chris Ruane - whose Vale of Clwyd constituency includes Prestatyn - said: "This kind of dehumanising language is utterly unacceptable and is incompatible with the values of the Labour Party." Vale of Clwyd Welsh Assembly member Ann Jones said there "was no place for these sentiments in society or in the Labour Party and I utterly condemn all forms of racism". Labour said it could not comment on individual cases, but complaints such as these "are fully investigated in line with our rules and procedures and any appropriate disciplinary action is taken". North Wales Police said: "This alleged hate crime is being investigated." Denbighshire County Council said it could not comment, other than to say the matter had been referred to the Public Services Ombudsman for Wales for consideration. The office for the ombudsman, Nick Bennett, confirmed he had received a complaint concerning whether Mr Murray had breached the council's code of conduct. A spokesman said: "The complaint will be assessed before a decision is taken on whether the matter should be investigated."